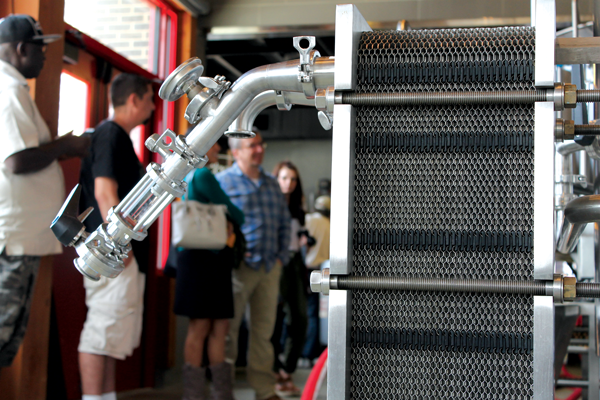 Students enrolled to the Journeyman Brewer program learn more about the craft brewing industry at Twin Peaks Brewery. On the last day of the Journeyman course, students who had brewed their own beer at the Twin Peaks Brewery were able to taste their finished product. Et Cetera file photo. Students could soon be brewing beer on-site at Eastfield as part of the Journeyman Brewery Program, which organizers are hoping to expand in 2019. A new online beer-marketing course for product packaging will begin this January. “The idea will be on logo creation and labeling for advertisement,” Angie Cook, new associate dean of programming for continuing education said. There will also be a class on home-brewing, which will be hosted at a local brewery, she said. Eventually, program director Ryan Ouellette said he wants to offer a two-year degree in beer brewing in a partnership with the Science, Technology, Engineering and Math division. The craft beer industry has seen a lot of growth in the past few years, in Texas and the United States as a whole. There are now 6,655 breweries nationally, and 251 in Texas, according to the Brewers Association. Growth has steadied and become less vigorous than the 2011-2015 boom, with a fewer number of breweries opening per year, Peter Boettcher, co-founder of the Eastfield Brewery Program and instructor, said. Many students who sign up for the Brewery Program at Eastfield do so as a Journeyman, someone getting into the industry as a worker on the ground floor. Ouellette said the classes typically see a certain type of student. There are many veterans who sign up for the program, he said, looking for a way to get jobs in breweries. Eastfield’s program offers lower cost than many other programs becoming available around the country, such as Siebel, Cicerone, and American Brewers Guild, making it more accessible to potential students. There are new online offerings, in addition to a recently started Level 2 Technical Program, geared toward students with prior experience who are looking to start their own brewery business. The Level 2 program goes further into the scientific concepts, and also discusses aspects of leadership involved with managing their own workers. Level 2 courses for the second fall term will begin Oct. 22. Level 1 Journeyman and Level 2 Technical programs run in a sequence through each semester, with one being six weeks and the second being eight weeks. All programs teach foundations of beer-making science including the chemistry of ingredients and the processes of fermentation and carbonation. “Getting the word out about our offerings is one of the biggest parts,” Ouellette said. The buzz is generated from press or events the program is involved in such as a presence at the Big Texas Brewfest, fundraising at local breweries, and being featured in All About Beer magazine. Brewing has become a North Texas trend and students enrolled in Peter Bottcher’s Journeyman Brewing Certificate course will learn everything they need to know to be able to brew their own beer. Et Cetera file photo. He said the school-branded materials such as growlers, logos, and ads are all designed in-house; and that many interested students had only heard of the school because they had somehow heard of the program by word-of-mouth or published media. Though it is changing and being improved, Ouellette said, there are still some people who sign up for the brew program because of an article they read three years ago. “I update the programs consistently, teach from A-Z, telling students the reason for why. 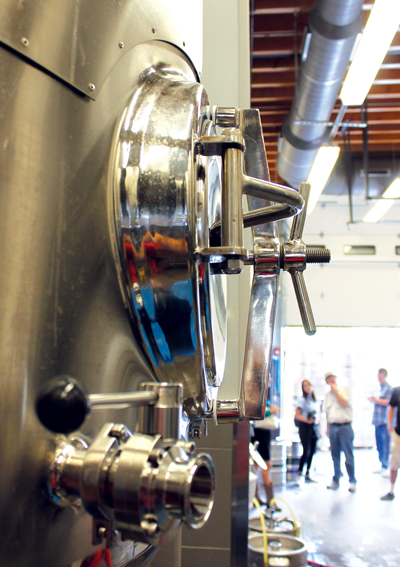 Why in brewing we do this or do that,” Boettcher said. Boettcher has worked in beer as a Headmaster for 30 years since earning a Bachelor of Brewing Science from the World Brewing Academy in Germany. He works as a Consultant Brewmaster, advising breweries on scheduling workers, training, and manual writing. Four years ago, he saw a need for more highly educated workers in the beer-making field and sought a founding partner. Eastfield became that partner. With program students coming from as far as Peru, Costa Rica and Alaska, Ouellette said Eastfield is staying ahead of the curve. One student who completed the program has been hired by Miller, with most going to work for small to medium-sized local breweries, and some in distilleries. The program has a 94 percent to 96 percent job placement rate for graduates, Oullette said. Distilling would be a possibility, in the future, as well, Ouellette said. New brewery partners are on the horizon for Eastfield as well, looking at White Rock Ale House – a brand new brewer who opened last year. “We would love to hear from students at the school on what piques their interests, what they want us to look into or think about for the program,” Ouellette said.